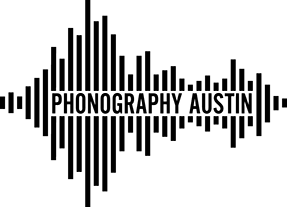 On its debut CD release, the Phonography Austin group capably demonstrates how it is united by a rigorous commitment to authenticity in communication, despite the full spectrum of different technical approaches adopted by its membership. As such, it provides an encouragement to new practitioners and a challenge to stereotypical conceptions of field / location recording. As per current member Vanessa Gelvin, the group has shown a healthy desire to avoid the ‘orientalizing’ tendency of recording only those phenomena and events which might be outside of listeners’ customary experience, and has instead expanded on the acousmatic tradition of showing how any sonic experience can contain seeds of newness or act as a spur to profound transformations – regardless of its intimacy or foreignness with respect to the listener. Laura Brackney’s slice of life as an urban pedestrian, going from a day job to a gamelan rehearsal. 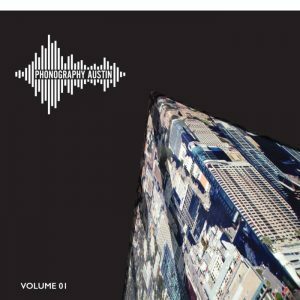 Kevin Sample’s microsonic perspective in a fascinating recording of the vibration of an active rain gutter. Sean O’Neill’s capture of a train passing closely in an acoustically bright environment. T Putnam Hill’s lull and calm of a cove on Santa Catalina Island. Junior Williams’ ritualistic space with a recording of an amplified Orthodox church service in Crete. Alex Keller’s immersion in a cluster of green tree frogs in the evening in Florida. Josh Ronsen’s uncomfortably close perspective on a box of bees. Vanessa Gelvin’s document of relief and suspense of the end of a performance.